Ya'll know this beaded necklace is still a novelty for me and in serendipity fashion, I found this cardigan recently while thrifting. At the time I found it, I wasn't thinking of the necklace, but look how well it works back. The fun-find cardigan is Joan Rivers brand and still had the tag on it. Isn't the crocheted-look back of it pretty? Someone had tried it on and left it on the "go-back" rack by the dressing rooms. We'll never know how it ended up where it did--my theory is the original buyer didn't care for or know what to do with the pale peach color. I'm saying that because even though it's in my color palette, when I first brought it home, I wasn't sure either. Then I remembered our old friend the color wheel. If you take a look, below, you see that the oranges are opposite the blues. Remembering that, I pulled out the chambray tank and, you guessed it, a match made in color-wheel heaven. I decided I wanted to get a more contemporary look with the beads and went with a more-is-more look. I took each side and tied it with a ribbon to give me a doubled up look. Funny story--the ribbon I had that matched best was a wire ribbon, so the darned thing kept poking me, but I'll suffer a little for fashion! 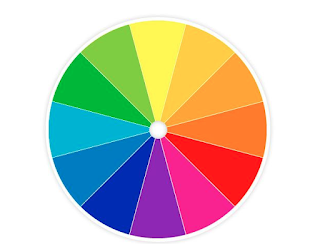 Envision a color wheel if you need some paring ideas. Doubling up a necklace and tying it with a ribbon or leather cord can multiply your looks.